Emmanuel Macron’s visit to Australia this week was unusual: he has not yet marked a year in office and it is the first time a French President has made a bilateral official visit. So why now? And what does Macron’s visit mean? Just 12 months ago, Emmanuel Macron, then aged 39, became the youngest president in French history. Few would have imagined that within the year he would command the world stage as undisputed leader of enlightenment and liberal democracy. It was, after all, his first political election. Neither he nor his fledgling Republique en Marche! Party had ever had a seat in France’s National Assembly. Within a few weeks, Republique en Marche! had won a majority of 308 in France’s legislature. The party is delivering a centrist program which has made Macron unpopular with the left and reduced his domestic approval rate to below 50 per cent. But on the global stage, Macron’s stock has been rising steadily. He has produced a blueprint for the survival of Western democracies in a troubled world. It has not only earned him standing ovations in that most francophobe of temples, the United States Congress, but also earned Macron plaudits for standing up to America’s mercurial president, Donald Trump. Macron has strengthened France’s claim to be the strongest partner in the transatlantic pact, given the optics of a tired Angela Merkel, a weakened Theresa May and the unpredictable and nationalistic Trump. After three days in Washington in late April, Macron was acclaimed by the influential US web site Politico as “the new leader of the free world”; the Washington Post suggested the future of the Western alliance was in his hands. Visiting Australia for the first time, Macron’s message also resonated loud and clear.” I believe very much in the relevance and future of our bilateral relationship,” he said. 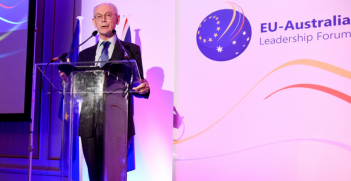 He offered Canberra an enhanced strategic alliance with France in the Indo-Pacific, including a new move to share intelligence on cybercrime. In doing so, he provided Australia with what it clearly lacks; a partner in a firm but cordial push-back against Chinese influence in the southern hemisphere. The move reinforces the American alliance, while avoiding buying into Trump’s trade conflicts with China. 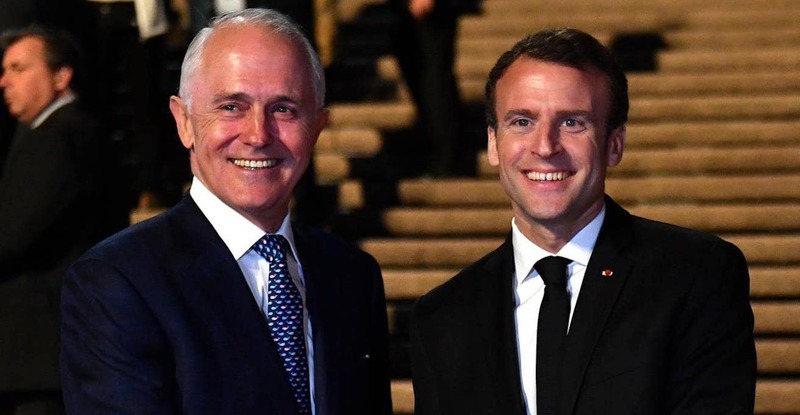 In Sydney on Wednesday morning, there was a glitch when Macron kept Prime Minister Malcolm Turnbull and dozens of other dignitaries waiting, delaying the start of a memorial service at the War Memorial in Hyde Park. Macron had not slept in. He was having to deal with the worst May Day mayhem in Paris for several years. Riot police arrested more than 200 protestors after 1,200 masked and hooded demonstrators smashed windows, wrecked cars and set fire to a McDonald’s store. Macron’s moves to slim down government and reform labour laws are creating unrest. But it was Macron’s 48-minute speech to Congress on April 25, delivered with energy and passion, that provided a lesson to those in the West who have begun to question the value of democracy or consider compromising the rules-based international system, long-standing treaties and respect for the rule of law to accommodate those who use economic or military muscle to intimidate. Macron warned against the dangers of “isolationism, withdrawal and nationalism”. Much of the Australian media ignored Macron’s speech. Those that did not tended to simplistic and superficial commentary, suggesting that the French president’s message was delivered as a rebuke to Trump. Calmly and in a matter-of-fact way, Macron reaffirmed his hope that Trump would not abandon the Iran nuclear agreement which the US and Europe signed with Tehran and that one day the US would return to the Paris Agreement on climate change, of which he sees himself as curator. Then he added: “We have to face it. Beyond some short-term disagreements, we have to work together”. In Paris, just before leaving for Australia, Macron called Britain’s Theresa May and Germany’s Angela Merkel. Both of whom had also visited Trump in the West Wing in the week before, but with less pomp and circumstance and no address to Congress. The three leaders agreed that even if they had failed to shift Trump’s determination to tear up the Iran nuclear agreement, they should take into account the US president’s concerns and seek additional agreements with Tehran. Macron’s central philosophy is that the West needs to “step up its game and build a 21st Century world order”, with the United States playing a central role. “The rule of law, the fundamental values on which we secured peace for 70 years, are now questioned by urgent issues that require our joint action”, he told the US Congress. He listed inequalities created by globalisation, threats to the planet, our common good, attacks on democracies through the rise of illiberalism, and the destabilisation of our international community by new powers and criminal states. “All these risks aggrieve our citizens who are living in a time of anger and fear,” he said. If we do not act with urgency as a global community, I am convinced that the international institutions, including the United Nations and NATO, will no longer be able to exercise their mandate and stabilising influence… Other powers, with a stronger strategy and ambition, will then fill the void we would leave empty. Other powers will not hesitate one second to advocate their own model, to shape the 21st century world order. The French president did not mention Russia, China or others by name, but there was little doubt as to who he saw as the potential enemy. “I do not want to belong to a generation of sleepwalkers, or a generation that has forgotten its own past”, was his parting shot. Colin Chapman is a writer, broadcaster and public speaker who specialises in geopolitics, international economics and global media issues. 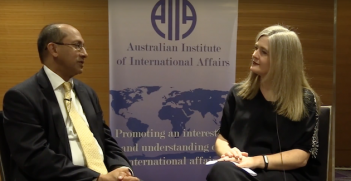 He is a past president of AIIA NSW and was recognised as a fellow of the AIIA in 2017. The EU has given individuals within the EU greater control of their privacy, with worldwide effect. 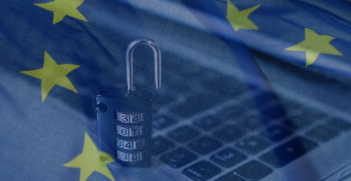 Australian companies should see the benefits of being GDPR-compliant.